← The earth shall SOON dissolve like snow? Who recently said, “Either convert them or kill them?” An Islamic terrorist or Cleric, right? It clearly sounds like Middle East rhetoric we’ve heard before, but in this instance, it was a famous Christian duck hunter. Phil Robertson seems like a very committed believer. In reading the book, “Duck Commander”, I came away with three thoughts. He really, really, really like to kill ducks (never heard of so many varieties), he’s a very simple man who loathes technology, and he loves the Lord. I believe he and his family are bold and courageous in their willingness to stave off political correctness and speak affirmatively concerning Christian values. In reaction, a FB friend’s repost simply stated, “‘Convert them or kill them.’ Congratulations, Phil, you just taught the philosophy of Islam.“ I found the ensuing debate rather intriguing and invigorating. Many Christians supported Robertson with a “get them before they get us” mentality, The first response was, “He ain’t wrong when it comes to radical Islam. However, since a conversion is unlikely with these radicals, just save time and go to option 2”. 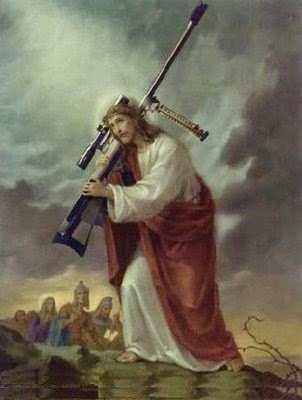 Another posited, “If Christians and “Christian nations” do not bring “liberty and justice” to the world, then who the hell will.” Yet another expressed an entirely different point of view when he simply wrote, “He’s Phil’s Christ”, and then linked the following photo of Jesus holding a 50 caliber machine gun. Though this guy (whom I have a great deal of respect for) could clearly benefit from a little spell check (which in and of itself makes him sound extreme), I don’t find his sentiment all that unusual. Perhaps most are not quite as blatant in their militaristic attitudes, but it appears that he’s clearly not out of the dispensational mainstream. Just watch the Hagee video and take a good look at the crowd as they cheer his war cry. At another time, John Hagee and Benny Hinn gathered to pray to lead “this nation into war…“ Though the Hagee ministry eliminated this prayer session from public view based upon “copyright infringement”, it can still be found here: John Hagee With Benny Hinn: Praying For War, In the Name Of Jesus. Certainly doesn’t remind me a whole lot of Jesus’ sermon on the mount’s “Blessed are the peacemakers for they shall be called son of God.” How did we get so far from the prayers for peace? But as much as it feeds our sense of justice to hold savages and terrorists to an account, is this a Biblically sanctioned response? ISIS may be out of control, but to pray for the annihilation of a sovereign nation that has NEVER attacked us (Iran), seems less than prudent. The question we must answer is if Hagee’s and Robertson’s message is that of Jesus and the NT authors? Where does “love your enemies” and “pray for those who persecute you“ come into the equation? Every last disciple (and yes, I believe John is included) died martyrs. Stephen didn’t even pick up a rock in self-defense and as he was dying said, “Lord, do not charge them with this sin.” And the one time a disciple attempted to use aggression to thwart the enemies of Christ, Jesus rebuked him and restored the ear of the enemy. So are Phil Robertson and John Hagee correct? What should we do? Following is an interview with Semse Aydin, the Christian Widow Who Forgave the men who brutally tortured and murdered her husband and two other missionaries in Turkey. In closing, please consider the following article, “Phil Robertson preaches Islamic doctrine? Convert or die?, as Joel McDurmon of American Vision weighs in on this debate. He wrote, “While Robertson’s sentiment resonates with a lot of people, especially conservatives stirred to outrage by gruesome videos of alleged beheadings and alleged threats to “America,” we must step back for a moment and check our reaction. On the surface of this quotation, Robertson’s response is little more than the doctrine of the very Islamic “thugs on steroids” he would confront. “Convert them or kill them,” is no different than the classic Islamic battle cry: “convert or die!” Is this really the response Christians should have? Is this what the Bible teaches? Is this even what the allegedly harsh and outdated Old Testament ethics for war would prescribe? No, it is not.